BIRNS, Inc., a provider of underwater and deep ocean lighting and connectors, has awarded its annual Debra K. Geist Memorial Scholarship to Rayna Kanapuram, a senior at Newbury Park High School in California. Kanapuram was honored at a ceremony where she was given a scholarship award of $500 to be used for college in the fall. 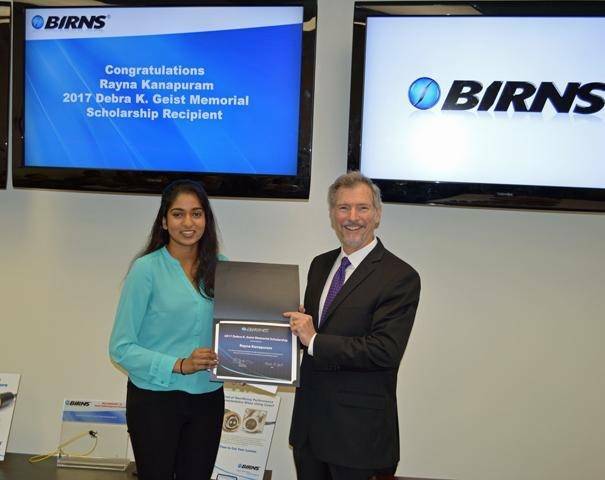 The late Debra Geist was BIRNS' Purchasing Agent for many years, before her sudden and tragic passing. In her memory, the company launched an annual college scholarship program to encourage and recognize high school students in Ventura County with strong leadership potential, committed to the pursuit of excellence in a business career. Kanapurum is a National AP Scholar and a National Merit Scholar finalist, with a Black Belt from the International Shotokan Karate Federation in Japan. She is the cofounder of the Girls Who Code Club, teaching high school girls computer programming with her own curriculum. Kanapuram will be attending University of California, Berkeley as a Regents' and Chancellor's Scholar in the fall. "We are so impressed with Miss Kanapuram's many scholastic and personal achievements," said Eric Birns, President and CEO of BIRNS. "She is an outstanding young woman, and perfectly embodies the spirit of this scholarship program."